Thank you so much for your business. We're here to help! If you're new to our website, we want to welcome you and hope that you find your experience on this website to be easy, informative and worthwhile. If you've been here before, chances are you're one of thousands of satisfied customers who have come to expect fast, courteous service. That's why we're here around the clock to provide unprecedented customer support to you and your business. You can always e-mail us using the form below or call 800.915.2196. Trained representatives are always standing by during normal business hours - 9:00 AM to 5:00 PM EST - to answer your calls and provide guidance and assistance with every order. If you prefer to communicate using our live chat feature, you may click on the LIVE HELP icon to the right to begin your chat session. 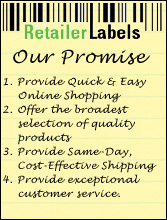 Of course, you may contact us via regular email at info@retailerlabels.com and someone will respond within 2 hours or less.